Big boys were once little boys. Ergo big boys will always be little boys regardless of age or status. And being little boys they will always believe their group or gang is the best. And again being little boys will look for ways to prove it. Thankfully the inner child always look for ways to prove its superiority and in Bay Street, seeking a new challenge from winning the TRU year on year, decided to broaden its horizons by throwing down the gauntlet to the Cayman Islands and seeing, figuratively speaking of course, who has the bigger daddy. Planning for the trip was uber secret with details more closely guarded than those for the D Day landing with requests for details terminated with extreme prejudice. Not that that was the end of the matter. Inspired no doubt by the thrill of anticipation from reading 50 Shades of Grey a countdown on the website counted down the days and and when the tour itinerary was eventually released all the tourists inner little boy was brought back to the thrill of Christmas Eve waiting for the big day. Finally that day arrived and all turned up bright eyed and bushy tailed....except Shippy, and in their number 1s.....except Dave Manii. For every ying there is a yang and for every Dave Manii there is an Alex Koppel. Koppel being the epitome of sartorial elegance turned up in an outfit more expensively assembled than most people's mortgage payments. Taking the little boy simile that extra step Doug Henderson arrived in his high school blazer.....bless. We had a training session also but that would take another tomb and there are beers to be drunk whilst messrs Goode and Burton appear on Cayman TV talking up the game. Images of Clubber Lang accosting Rocky spring to mind. I pity the fool who upsets Jon. Farewell my dear friends and as we prepare for dinner, no doubt to employ shock and awe tactics Pig style, I must bid you adieu until tomorrow. It is said that a week is a long time in politics and that 24 hours is a long time in sport. Sport being what it is one can go from hero to zero or zero to hero in a very short timeframe. What can also happen is that fate plucks an individual or individuals from obscurity and catapults them into the limelight. To the names of Jesus Christ Superstar, Susan Boyle and Joffrey Lupal one can now add Mr. Jon Goode and Mr. Dave Burton. Although high profile within the Pig world they were mere grains of sand in the grander scheme of things until fate decreed otherwise. For last night both gentlemen experienced a life changing event when they were asked to represent the Pigs on local Cayman TV. Neither being one to leave things to chance they turned out immaculately dressed: so much so that it appeared to the casual observer that they were in fact the hosts of the show and the hosts were the guests. Bizzaro world indeed. Apparently now one can book these debonair gentlemen as a duo or individuals for store openings, bar mitzvahs or book readings. Consequently rumour has it they are insisting no one looks them directly in the eye and must refer to them as 'sir' even on the practice field. Their pre-match ryder subsequently submitted to Mr. Rouanet demands a bowl of M&Ms for their own personal use with all the brown ones removed. The mood in the camp this evening is one of measured concentration. All Pigs are in good form but there is no doubt that each and every person has something bigger on their mind: that first hit, scrum, lineout, not wanting to let themselves, teammates or club down. Make no mistake folks this is serious stuff and whatever happens on the pitch tomorrow every Pig will have given his all. Will Simpson made a great point after training to the group about not being intimidated by reputations of teams or individuals. I have no doubt this will be taken on board. Bay Street lost against the Cayman Islands Select XV 37-5 but like a politician in a witness box this doesn't tell the true story. From loose head to full back this was a performance full of heart, vigour, commitment and no little guts that gives huge encouragement for the upcoming season. But enough about the post match bar antics, lets get back to the game. Splendidly attired in matching pink training tops the Pigs were a team from the moment they stepped onto the pitch for warm up to the 80th minute. The game kicked off with the Pigs taking the game to the opposition in no uncertain terms. The first scrum saw the Cayman Islands shunted backwards at a rate of knots which was followed by hits of such ferocity that tsunami warnings were in danger of being triggered. The game was played in four quarters: a non-negotiable stipulation from the celebrities Goode and Burton to allow them touch up their makeup and fix their hair. The local TV was there after all. After falling behind to a penalty and breakaway try the Pigs rallied. Will Simpson in full flight is a frightening prospect. Receiving the ball on the 10 metre line Will took off and ran with the speed and power that made the opposition as committed to tackling as Lindsay Lohan is to her rehab program. Conversion missed and it was 8-5 to the Caymans where it stayed like that for much of the first half until another breakaway try on the verge of halftime saw them stretch their lead. Execution really summed up the difference between the teams: this was our first game of the season whilst the opposition was coming to the end of theirs. The second half began much like the first with the Pigs taking it to the opposition. Dan Yungblut is worth his weight in gold. Dan isn't a flashy player or the most skilful but Dan is what every team needs: a man who hits every ruck, makes every tackle, supports every run and gives the same high level of intensity from minute 1 to minute 80 without it ever dropping. Perhaps word of this stamina and longevity got round the bar last night to make Dan a highly sought after commodity with the local ladies. Lucky boy: just don't leave it on the pitch Dan. Midfield was the area of concern beforehand as this was the oppositions perceived strength. Not on this watch though. Messrs Simpson and Robinson made sure early on that their counterparts knew they were there and their game plan was quickly altered to go around the centres rather than try to go through. Perhaps they got encouragement from Chase's patented U.S. Marines Vulcan Death Grip application which saw a high turnover of bodies in his vicinity. Trevor Anderson was another standout player on the night. Running hard, running fast, running like Mexican water through a first time traveller Trevor made sure that every one of the opposition knew he was around. A quite stunning performance. Greg Hall, no doubt inspired by 1960's Japanese monster movies, had a beast of a game. If one was to describe Greg's performance think of Greg as Godzilla and the Cayman team as Japan. Glorious chaos and destruction abounded. Perhaps it was the heat but Mr. Rouanet turned back the clock to his halcyon Mediterranean days of yore and turned in a wonderfully pithy and belligerent performance. Philippe went some way to claiming the prize of Sportsman of Tour by splendidly applying his fist to their flankers nose. 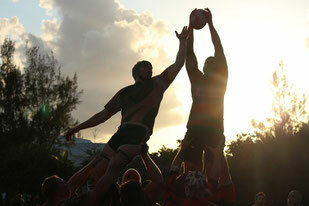 This is how it was in the good old days of amateur rugby. Too bad the referee didn't feel the same and brandished a yellow card. Also too bad the referee or home touch judge didn't see, or feel the need to report, the run from 3 yards back before launching torpedo style directly at Philippe at a ruck when Philippe was not part of it. Final word on the game should go to the Cayman old boy duo of Tom Kimball and Dave Burton. Bay Street's very own Bert and Ernie were simply brilliant. Dave is majestic on the ball, is hugely respected and effortlessly assumes the leadership mantle. He is also a pleasure to watch. Tom consistently produces high quality go-forward ball and has the heart of a lion. To see him in the 80th minute still taking on the opposition and regularly needing three men to take him down is just inspiring. This observer wasn't the only one who felt this way as Tom was deservedly awarded man of the match by the opposition. Long may you run Tom. Finally thanks to the replacements, playing and non-playing who all pitched in whether it be Geoff Osbourne giving up his place on the starting 15 to accommodate another player, or Mitch Hansen travelling from Australia, Eric Dobs travelling from Calgary or John Hewitt coming from Halifax just to be part of Bay Street's first overseas tour or Doug Henderson for sheer entertainment value. Mark Johnson making his Pigs debut put in some crunching tackles. This is a group that is a privilege and just a joy to be part off. The tour is not over but the main focus of it is. I have no idea if there will be more posts (demand will dictate one supposes). If it is I will leave you with this thought from George Bernard Shaw: "Never wrestle with Pigs. You both get dirty and the pig likes it". Van Morrison sang about them and although melodically pleasing its understanding passed this writer by until our tour came to an end: "my momma told me there'd be days like these". 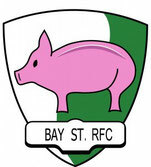 Result aside the inaugural Bay Street RFC tour has simply been an unqualified success with ne'er the dull moment. Right off the bat huge heartfelt thanks have to go to Messrs Rouanet and Pummell for the work they put into organizing the trip. Our livers may not thank you but the rest of our bodies do: thank you gentlemen. The sign of a great tour is that there is no one highlight but great memories piled high on each other. The court session was spectacular and was delightfully run by Justices Goode and Tait demonstrating a unique interpretation of due process. The International Court of Human Rights would not have been impressed. Dave Tait put the good of the club before his own needs and after playing a great game in the second row instead of his customary loose head position later demonstrated his tactical nous that night by encouraging not one but seven different Pigs tourists to describe what they saw in the distance as Tait turned on the outside shower directly above them. All to a hugely appreciative gallery of tourists and residents. 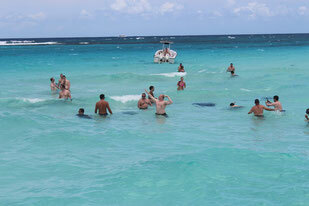 The bravery and guts demonstrated on the field of play was distinctly lacking when we visited Stingray City. Grown men became the cartoon version of an elephant seeing a mouse and several glasses were shattered on boats nearby such was the level of high pitched screaming. Sadly but appropriately it is now time to wrap up and get back to reality. This touring party will depart but wherever life's rich tapestry may take us the memories of the past 5 days will live long in each and every persons mind. Joyous wonderful childlike fun and lung bursting laughs have been the common theme of the tour. Many new friendships were made, old ones were reinforced and a common bond emerged. The Bay Street Pigs will flourish and develop from this: Lord help the upcoming opposition. Over and out from the Pigs in Paradise.